This majestic Bhutanese architecture precariously perched on a cliff 900 meters above the valley has intrigued travelers across the globe. 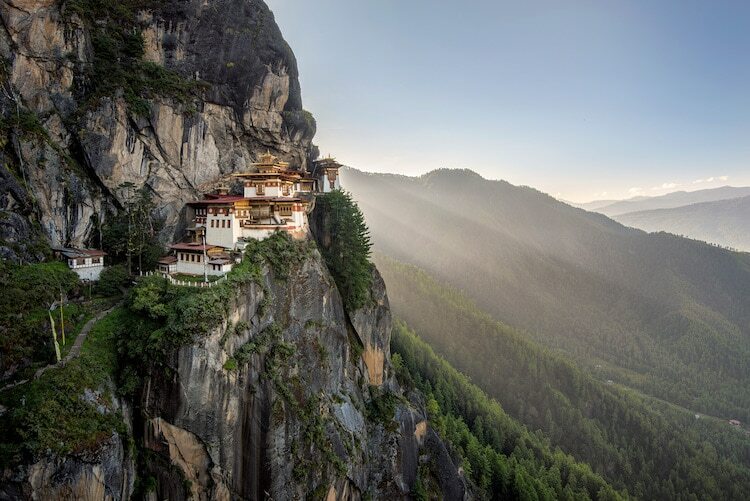 Taktsang translates to “The Tiger’s Nest”. Locals believe that Guru Padmasambhava, who introduced Buddhism in Bhutan, flew riding atop a tigress and it is believed that he meditated in the cave for three years, three months, 3 days to subdue evil forces in the 8th century. The current monastery was subsequently built around this cave in 1692. The Tiger’s Nest is one of the most sacred places in Bhutan and perhaps the most visited tourist attraction. Located 10 kilometers north of Paro valley, it’s a 20 minute drive to the base where a challenging 2 hour hike to the monastery awaits. The hike is uphill for the most part but not very steep. For travelers who are not physically capable, horses are available for hire to carry you most of the way up. The wide dirt trail takes hikers in and out of the pine forest with the sight of monastery disappearing and reappearing through the entire journey upward. Halfway through the journey, hikers will reach the popular cafeteria where lunch is served and the place offers a good vantage to soak up the panoramic view of the valley below and a close up view of the monastery above. At the maximum elevation on this hike, hikers find themselves overlooking the Taktsang monastery before descending down the stairs and come across a giant waterfall. A small bridge covered in prayer flags take hikers across to the monastery. Prior to entering the monastery, hikers will have to leave any photography equipment at the security. After exploring the monastery, hikers then proceed back to the base. Hikers are advised to wear good hiking shoes and also bring their camera to make the most of the trip. October to December has ideal weather with clear blue sky to visit the place.